Super Savings Item! 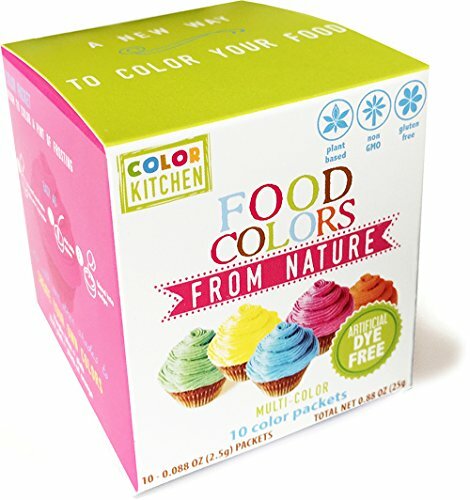 Save 31% on the Food Coloring - ColorKitchen Color Packets (10 Pack) - Blue, Pink, Yellow, Orange, Green - (2.5g Per Packet) - Natural - Vegan - Non-GMO - No Artificial Food Dyes- Highly Concentrated Powder Pigment by ColorKitchen at Smokey Robinson Foods. Hurry! Limited time offer. Offer valid only while supplies last. BYE BYE, ARTIFICIAL DYES: We use all natural colors even when more expensive because we believe the overall health cost of using synthetic food dyes is greater. A SWEET NATURAL ALTERNATIVE: To us, synthetic food coloring pales in comparison to the brilliant colors that can be made by turmeric, beet, spirulina and more. POWDER MIX YOU'LL LOVE TO USE AND REUSE: Refresh an opened packet instantly with a couple drops of water for vibrant color that can outlast liquid's shelf life. ONE PACKET, NO PROBLEM: Because just one color packet can be enough for a cake, a dozen cupcakes or cookies, or anything needing up to a pint of frosting! 100% SATISFACTION GUARANTEE: We want you to enjoy using our natural food dyes, so please contact us if they fall flat for you in any way and we'll refund you. If you have any questions about this product by ColorKitchen, contact us by completing and submitting the form below. If you are looking for a specif part number, please include it with your message.